What are health utilities? | Whatis Series...? Utilities are cardinal values that represent the strength of an individual’s preferences for specific health-related outcomes. Measuring health utilities involves two main steps: defining a set of health states of interest, and valuing those health states. There are direct or indirect methods of utility valuation. The methods that have been used to collect data on utilities include the standard gamble approach, the time trade-off approach and the visual analogue approach. The main indirect methods of utility measurement are: the use of generic preference instruments (EQ-5D, SF-6D and HUI), the use of disease-specific preference measures and mapping from a disease-specific health-related quality of life instrument to a generic instrument. Generic preference-based measures are increasingly being used in cost–utility analyses of pharmaceutical and other healthcare interventions. In the UK, the National Institute for Health and Care Excellence has specified the EQ-5D as its preferred method of utility measurement. 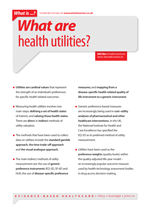 Utilities have been used as the preference weights (quality levels) within the quality-adjusted life-year model – an increasingly popular outcome measure used by health technology assessment bodies in drug access decision-making.